CHRISTOPHER DORNER BURNED ALIVE, ETERNALLY BURNING? 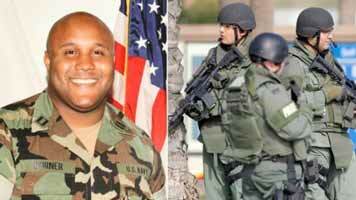 I have been contemplating how Christopher Dorner, if it is true that he died, experienced his last moments on earth. If he was burned alive as headlines suggest, how terrible it would have been for him to suffer the torments of a furnace of fire. I don’t know what it feels like to be trapped in a fire, but I cannot imagine it being not fearful, no matter who you are. And whether Dorner was unconscious from a self-inflicted gunshot wound, or whether he became unconscious from smoke inhalation, or whether he was burned consciously until his heart gave out from the pain, his flesh surely melted to the point of charred remains, perhaps dental records being the only hope for confirming the suspect’s identity. Yet, however you may picture Dorner perishing in the flames, and what the roaring flames would feel like as they engulfed him, it fails in comparison to what Dorner is feeling now if he died as a murderer. Matthew 13:42 calls it a furnace of fire. Other NT Scriptures refer to it as a lake of fire. While others refer to it as the blackness of darkness. we find everything that gives an idea of an extreme misery is used to set forth hell torments because no one is sufficient to express it. Dorner, if a dead murderer, is facing that reality now. He has found ultimate justice in the hands of the Living God. The experience of Dorner is dreadful. Eternally dreadful. He has begun drinking the bottemless cup of the Lord that is filled with the foaming wine of His terrible wrath, and Dorner will drink it down to the dregs (Psalm 75:8). Burning brimstone or melted metal, whatever you imagine the glowing heat of God’s wrath to be, this is the eternal resting place of Christopher Dorner. But he will not lose consciousness, and his flesh will not melt away. He will be eternally destroyed, but not utterly destroyed, rather an everlasting presence of beingdestroyed. This will also be the resting place and condition of each carnal christian, every idolater trusting in their own righteousness, and every person who suppresses the truth of God in their unrighteousness. Repent, and believe the Gospel, or you will likewise perish. Yield yourself to the Lordship of Christ and obey Him, or you will glorify Him in your destruction. WHAT DIFFERENCE DOES IT MAKE WHAT SOMEONE BELIEVES ABOUT GOD?